Grupo Folklórico Los Mejicas was presented with two awards of recognition during the troupe's annual spring concert Friday, June 3 and Saturday, June 4 at the UC Santa Cruz Main Stage at the Performing Arts Complex. Watsonville Mayor Daniel Dodge proclaimed Friday "Grupo Folklórico Los Mejicas Day" in Watsonville in honor of the group for "preserving the beauty of our Mexicano/Latino heritage and cultura through dance, and for providing a safe place that creates a community of peers bound together by the love of dance and cultura." The next evening, Daniel Dodge, Jr., representing Assembly member Bill Monning, awarded the group with a certificate of recognition from the state Assembly. This year’s show, “El Orgullo de mi Tierra,” or “the pride of my country,” was the culmination of a year of training and rehearsal for the student-run group and marked its 39th anniversary. The dance performances showcased traditional folkloric dances from six regions of Mexico: Nayarit Costa, Durango, Puebla, Colima, Tabasco, and Veracruz. Invited guests, Raices de Santa Cruz, a folklórico group based in Beach Flats performed dances from Oaxaca. Anthropology Professor Olga Najéra-Ramírez, who danced with the group as a UCSC student and continues today as faculty advisor for Los Mejicas, accepted the awards along with Mejicas co-directors Lorena Lopez and Mariela Melendez. She described the performances as "amazing." 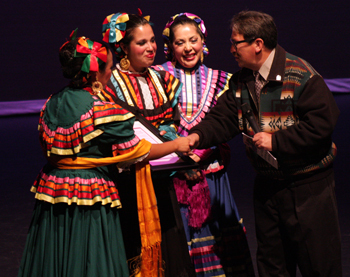 Grupo Folklórico Los Mejicas was founded in 1972 and is open to students of all cultural and ethnic backgrounds.